Oxford: Oxford University Press, 2013, 200 pp., ISBN 978-0-19-966455-9, £70.00. Copyright and Mass Digitization addresses the composite and challenging relationship between mass digitization- defined as the process of bulk digital transformation of copyright works in order to serve the operation of digital repositories or other online resources- and copyright law, whose conventional norms and principles appear nowadays to be significantly challenged by the former. The authors pose several stimulating queries with regard to the suitability of the current legal infrastructure to accommodate new and potential demands brought about by mass digitization. Each query is powerfully pursued, suggesting well-argued responses, but also leaving room for other possible solutions. They explain each topic using clear language and an illustration of some of the most pertinent cases pertaining to different jurisdictions, as well as an updated picture of recent legislative reforms and proposals. This approach, which provides readers with case synopses and a thoughtful analysis of court reasoning, illustrates how mass digitalization may change our traditional experience of copyright works in a far reaching manner, and is also likely to result in resilient clashes. First, the authors question whether and to what extent the potential positive outcomes of mass digital activities, especially from a public interest perspective, may clash with current copyright regulation. This paradigm is creatively and effectively described in terms of the image of copyright “turned on its head”, meaning that it has shifted from a traditional regime of ex ante authorisation to an opt-out regime. In the latter system, the author’s consent is no longer required to conduct activities that have traditionally been conducted with permission, such as the copying and reproduction of copyrighted material; instead authors can only ex post facto exercise the option to object to the usage of their works. The book comprises of seven well-structured chapters. The first chapter introduces the subject, providing the reader with a discussion of the public interest aims of mass digitalization which includes the desire to make works available, a necessary precondition of satisfying the commitment to the advancement of learning in the digital era. Although mass digitalization has proved promising in terms of cultural development and access to knowledge, it remains an undoubtedly ambiguous and complex subject when considered from a legal point of view, as its legitimacy remains uncertain. In particular, this is true with reference to the purposes of access to and computation with works, which appear to be much more problematic than mere preservation since they are likely to pursue more exploitative aims, particularly when using the work’s content to process- and make use of the information enclosed, conceivably unrelated to the public utility of making works accessible. Chapter two succinctly examines the issues surrounding transformative uses of copyrighted works that give the work a new function and purpose through the application of a new technology. Acknowledging that such activities are unquestionably valuable and may revolutionise our traditional ways of experiencing copyright works (i.e. digitising the reading experience), however, it is also undisputable that they inevitably converge with restricted activities, such as the right of reproduction and communication to the public, and it is not certain whether they are or should be allowed. Transformative uses are illustrated by looking at both the European and US legal frameworks, which gives the book additional value in terms of comparative analysis. The authors suggest that it may be easier to find consensus in favour of transformative uses in the US by appealing to the doctrine of fair use. Nonetheless they also highlight some attempts in the European context to exempt these activities from infringement. In this vein, they discuss the German theory of implicit licence, the French defence for passive internet service providers, and the Spanish application of the doctrine of ius usus innocui. The authors appear critical of these activities, describing them as inadequate and unable to draw a clear line between allowed and prevented acts. The third chapter deals with automated test processing and data mining, practices that are explained in a clear manner which can be easily understood by non-technical readers. Although, in general, statute law does not legitimate these specific uses, there have been some efforts to regulate them, including the proposed UK copyright reform, the projected European Copyright Code, as well as the only example, to date, of a statutory regulation for technological uses within the Japanese Copyright Act, all accurately described in the book. At the same time, the authors wisely consider whether introducing such exceptions may result in a conflict with the traditional three step test establishing the exploitation of a work. The problem remains to assess whether this should be considered traditional exploitation, especially if automated text processing is embodied in licence agreements. Therefore, although automated text processing and data mining are likely to find statutory regulation in the near future, the reviewer shares the authors’ broader concerns about the need to consider carefully any legislative change in the copyright system, which seems to be complicated by the intrinsic uncertainty of the current system. This is the case, for instance, for orphan works, further explored in chapter four which also deals with the distinct category of out-of-print works, both fostering a situation of uncertainty that potentially impedes their digital exploitation and eventually dejects their use. Given the extent and pervasiveness of the orphan works phenomenon – defined by the authors as a structural inefficiency that affects copyright worldwide, partly due to the lack of compulsory formalities – the book offers a wide-ranging analysis of some recent attempts to regulate it. It first examines the EU Directive on Orphan Works, aimed at promoting mutual recognition of the orphan works status to improve the dissemination of knowledge online. It then refers to the collective compulsory licensing experienced in Scandinavian countries, considered highly valuable by the authors and plausibly transplantable in other countries. Finally, it illustrates the private ordering mechanisms that have been created by the partnership between public and private actors to carry out mass digitization activities, including those envisioned in the attempted Google Books Settlement and the Orphan Works Project of HathiTrust. With regard to out-of-print works, the authors consider the practicability of these solutions to allow redistribution of currently unavailable works and welcome them as reasonable. They seem to be less positive towards the system of mandatory collective management for non-commercially available works introduced in France with Act No. 2012-287, especially in consideration of the opt-out clause of the French initiative. Even though such a system might conceal a greater risk of generating sui generis entitlements, this reviewer asserts that, at present, there seems to be little evidence to support this apprehension, whilst conceding that this French law is indeed too recent to allow more evidence in this respect. The fifth chapter is dedicated to the analysis of new monopolies that mass digitization may foster. Developing this argument, the authors assume that whoever invests in digitization has a clear and strong interest similar to the one that typifies the property law doctrine of adverse possession or the principle of prescriptive easements. As a result, given the exploitative nature of these activities, there is a probable risk of locking digital collections through legal entitlements, particularly in terms of new sui generis database rights, whose intrinsic resilient powers have already proved to exceed the scope of copyright. Nonetheless, as correctly emphasised, such locking may be prevented or limited by antitrust and competition law, which can intervene when an abuse of a dominant position is detected. The authors consider the implications of other entitlements, such as the above mentioned private order mechanisms which if not monitored, may affect the contractual party and society as a whole by merely pursuing private interests, which may conflict with the public interests benefited by mass digitization, assuming that culture and knowledge are considered public goods. A considered example of this trend, which once again demonstrates the authors’ deep knowledge of the subject, is offered by the contracts signed by Google with public libraries worldwide, described as being extremely controversial, especially with respect to the restrictions imposed on libraries through anti-crawling provisions. Such digital monopolies greatly challenge the established copyright norms by changing the way works are used and expanding the latitude of permitted uses in the context of mass digitization, which may also have consequences for integrity of the work. This issue is further developed in the sixth chapter, which focuses on the effects produced by mass digitization on copyright works with respect to the work’s right of integrity, acknowledging that when works are digitized, there is a risk of altering their integrity, especially when it comes to industrial-based digitization. According to Borghi and Karapapa, in the context of mass digitization, an infringement of the work’s moral right of integrity may result from a way in which the work is displayed or used, that was not foreseen by its author or which actually hampers the public interest. However, the authors seem less concerned with the work’s right of attribution, or at least they do not address it directly apart from mentioning the problem of identification with regard to orphan works. In the reviewer’s opinion, it would be worth scrutinising the issue in broader terms when considering potential threats to the integrity of the work in the new copyright environment. Indeed, the authors properly acknowledge that not every modification that affects the structural or contextual body of the work is a violation of the work’s integrity. They note that the legal challenge is to draw a distinction between modifications that are technologically necessary and those that are incompatible with a work’s function, which implies a redefinition of the regulatory framework for mass digitization. Using a similar approach, the authors look at indexing and searching, providing a technical but clear analysis, particularly with reference to the resulting association of a work with other works and products (which can be of a commercial nature), raising questions of whether such an association is compatible with the nature and purpose of the work. The seventh and last chapter suggests that any reform of the regulatory framework for mass-digital activities could benefit from looking at the regulatory framework for other collections of information which have similar public interest aspects, e.g. the databases that contain human genetic information. Postulating that they share a disclosure-sensitive element, as they remain private unless their owner discloses them, but after disclosure can both gain economic value, and both represent an expression of human personality. In order to explore the comparison, the authors provide a detailed analysis of the Human Genome and Population Genetic Databases and the UK Source Informatics case on the use of patients’ anonymised information without consent. Following an examination of the conditions upon which the processing of personal data is lawful according to the EU Data Protection Directive – namely when it meets the conditions of informed consent, proportionality and legitimate purpose – the authors then reflect on whether the same principles should apply by analogy to the automated processing of works. In conclusion, by raising and developing some very thought-provoking questions, the book effectively achieves its goal. It shows how mass digitization, whose ultimate purpose is empowering knowledge access, learning, and social welfare, is not inherently discordant with copyright principles. However, it may currently come into conflict with established copyright norms given the absence of a more definite regulatory framework. 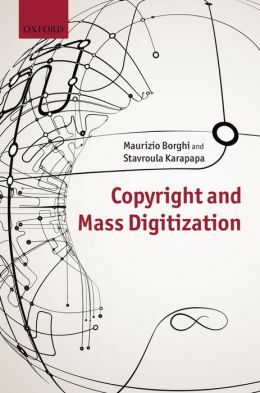 By acknowledging the inadequacy of the present copyright system, Borghi and Karapapa illustrate with coherence and clarity how mass digitization has transformed the conventional concepts and principles of copyright law. By including an analysis of what is and should be considered an act of infringement and how this applies to mass digitization activities, the authors strongly make a case for its redefinition in light of the challenges posed to the traditional regime of copyright. To sum up, Copyright and Mass Digitization offers a perceptive and in-depth contribution to the subject matter, explaining technical terms in a clear manner and providing a thorough and comparative analysis of controversial issues, which are exemplified through cross-jurisdictional case law. These features make the book a valuable companion for academics and legal practitioners from both civil and common law systems, as well as members of the general public who wish to understand the complex and critical dynamics of mass digitization in the copyright environment.